Thollem Mcdonas (here featured under his "Thollem Electric" nominal alter ego) and Rob Mazurek need no introduction for those who have followed things just a bit in the last fifteen years or so. Innumerable projects and polymorphic collaborations have pushed both artists to global renown; the former's special versatility on the keyboards and the latter's conjunction of visual art with various combinations of brass and electronic instruments have nearly become standards by now. Still, the couple had not met until January 2016. They joined forces for an exhibition of Mazurek's works, Marfa Loops Shouts And Hollers, held in the Texan city of Marfa. 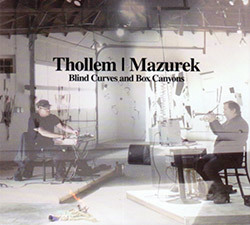 For the occasion, Thollem recurred to a modified electric piano enhanced by analog pedals whereas Mazurek employed cornet, bells, modular synthesizer and sampler together with his voice, appearing every once in a while in a somewhat ritualistic form of free chant not exactly nourished by any kind of firm intonation. The same abandon of preset schemes and rules permeates the entire album, which comprises a pair of extended improvisations (18 and 20 minutes respectively) plus a shorter conclusive segment. The lone imperative linking the spirit of the performers reads "produce abstraction without minding too much about aesthetic judgments". The deformation applied by Thollem to his keyed palette runs parallel to Mazurek's misrepresented melodies and murky non-chords. Fluctuating masses of unshapely and frequently acrid timbres require maximum openness before a level of confidence within the dissonant environment is reached. Occasional openings introducing slightly quieter segments allow some breathers; however, the overall feel is one of challenge to expectation. Two musicians liberating their selves "in the moment": no second thoughts or, worse, intellectual mannerism. Ultimately, Blind Curves And Box Canyons may not be of everybody's liking. But, sure enough, it incorporates long stretches of uncompromising music.